Welcome to Alternative Canine Training - a Michigan Dog Training company that provides top notched dog training solutions for dogs of all sizes and levels of canine behavior problems - including removing aggression in dogs. From trying to stop a dog from chewing on the furniture to potty training your dog or removing dog aggression, Vladae Roytapel is Metro Detroit's best dog training expert dog trainer. As compared to other dog training companies, this Alternative Canine Training expert is a professional of all types of dog behavior problems and solutions. Alternative Canine Training built a cutting edge website to provide free dog training tips and dog training dvd by the world famous Russian Dog Wizard, Vladae Roytapel. Michigan dog training in Metro Detroit and the Best Dog Trainer in Michigan now offers no nonense dog behavior problem solutions through the world's first and only patent pending dog training DVD system on DVD. Michigan's best dog trainer Vladae Roytapel, the Russian Dog Wizard, welcomes you to tour our best dog training website and tips for removing dog aggression. Vladae the Russian Dog Wizard and Expert Michigan Dog Trainer Offers Free Dog Training Tips for removing dog aggression and Professional Dog Training DVD Secrets on this website. If you're looking for advice and free dog training tips, then you have definitely come to the right place! The Russian Dog Wizard has offered a plethora of Dog Training Tips and articles on dog training PLUS his Expert Dog Training DVD. Based in Michigan, Expert Dog Trainer Vladae gives you free dog training tips on how to stop the dog from chewing on furniture and potty training your dog. 911DogWizard.com is a Strategic Web Estate Development Project by Zealous Marketing - Promoters of the DubLi Reverse Auction. "Dog Wizardry Makes a Miracle"
"Magic unfolds with Vladae The Dog Wizard." "CAPS Companion Animal Protection Society complement Vlade�s job working with rescued dogs"
"He turns delinquents into well-behaved pets"
"Dog trainer leads David Letterman around on show"
"The Amazing Russian Dog Wizard"
"The secret to dog training? An innovative approach"
By turning the most notorious canines in Michigan into angels and with the ability to succeed were all others fail, Vladae gained renowned recognition and became a celebrity himself. 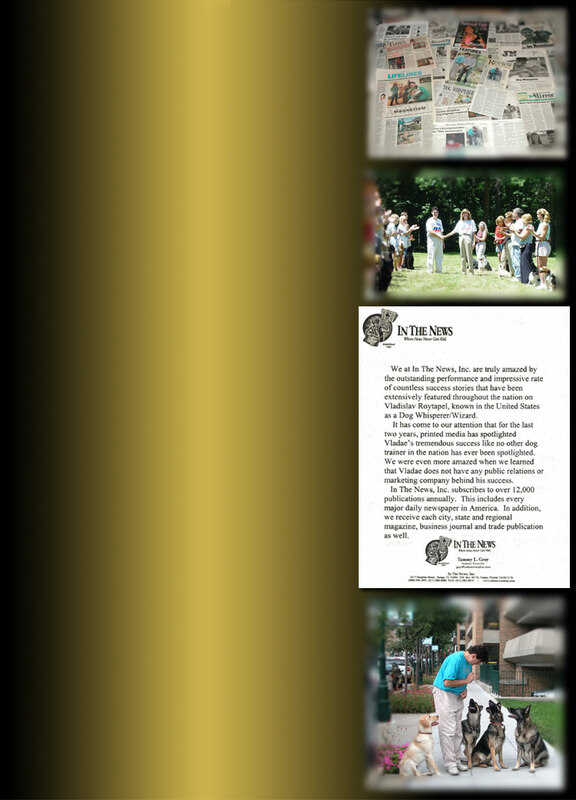 Vladae and Alternative Canine stories are extensively featured regionally and nationally as one of the most successful dog training companies in the nation. He appeared on numerous radio talk shows, on breaking news on local television stations and countless success stories in newspapers and magazines. Alternative Canine Training is named in the media as Michigan's No. 1 in-home dog training company. Now Vladae goes nationwide. 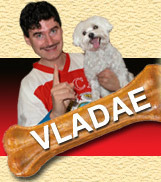 Vladae is nationally and internationally recognized as one of the most successful dog trainers. When it comes to working with problem dogs he is the best in the field. "I'm with owners and dogs throughout the day," says Vladae. "I don't provide a theory - I provide a service. I provide results." Vladae teaches people to be the leader and set the tone in the relationship with the dog. "In a lot of households with problem dogs, I see the dogs doing the leading and the owners doing the following. The dog wants you to be the leader so it can fulfill its role of loving companion and helper." Vladae teaches dog owners how to walk as a leader, talk as a leader, think as a leader and act as a leader in a way the dog will understand. "If you are not the leader both of you will be frustrated," he says, and things will never change for the better." You can turn your dog from the leader to the follower by teaching your dog to walk on a loose leash. Vladae says: "Remember there are two positions in your relationship with your dog. Either you walk your dog or your dog walks you. If your dog walks you, then your dog will walk all over you in all other aspects of your relationship. But if you walk your dog, then you will turn him from the leader to the follower." All training techniques are proprietary and exclusive to Alternative Canine Training By law. All rights reserved for private use only.